KUCHING: Parti Pesaka Bumiputera Bersatu (PBB) Samariang Women’s wing held a mini carnival at its service centre located at RPR Phase 1, Jalan Astana here yesterday. Assistant Minister of Early Childhood Education and Family Development, Sharifah Hasidah Haji Sayeed Aman Ghazali officiated at the event. 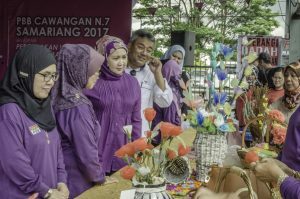 Sharifah Hasidah (third left) and Cr Abdul Baderi Sahmat visit the booth for the competition in flower handicrafts made from recycled materials. In her speech, she said the party must remain relevant to the people by organising interactive activities from time to time. “This is also in line with the government’s plan to create a creative and innovative generation in order to have a productive and healthy community,” she said. Hasidah also mentioned the need to be IT-savvy in the digital era. Also taking part in the carnival were the Health Department and the Malaysian Anti-Drug Agency. Cr Abdul Baderi Sahmat presents a prize to Damia Maisarah, one of the winners of the Mathematics competition for children aged 5 and 6. Among the activities held during the carnival were free health screening, an awareness talk on dangers of drugs, a story-telling competition in English, a colouring contest and a Mathematics competition for children aged 5 and 6, Zumba exercise, a telematch, a traditional cake making competition and a competition to make flowers from recycled materials. Some 200 people came to the carnival. PBB Samariang women hold mini carnival 0 out of 5 based on 0 ratings. 0 user reviews.